Macrophages play a major role in the development of vascular lesions in atherogenesis. The cells express FcγRIIIa (CD16) identical to that in NK cells, but with a cell type-specific glycosylation, and these soluble forms (sFcγRIIIa) are present in plasma. We measured sFcγRIIIaMϕ derived from macrophages in plasma from subjects undergoing an annual medical checkup. The levels of sFcγRIIIaMϕ increased with age, and correlated positively with body mass index, blood pressure, LDL cholesterol to HDL cholesterol ratio, triglycerides, hemoglobin A1c, and creatinine, but negatively with HDL-cholesterol levels. The sFcγRIIIaMϕ levels were related to the number of risk factors for atherosclerosis: such as aging, current smoking, diabetes, hypertension, hyper-LDL-cholesterolemia, hypo-HDL-cholesterolemia, and family history of atherosclerotic diseases. In addition, the sFcγRIIIaMϕ levels were correlated with carotid maximum intima-media thickness (IMT). These findings indicate the macrophages are activated during the incipient stage of atherosclerosis, and suggest sFcγRIIIaMϕ may be used as a predictive marker for atherosclerosis. Fcγ receptor type III (FcγRIII: CD16), one of the low-affinity receptors for the Fc region of IgG, exists in two alternative forms. FcγRIIIa is an integral membrane protein expressed on natural killer cells (NK cells), on a subset of T lymphocytes, and on a subpopulation of monocytes and macrophages (1), and shows a cell type-specific glycosylation pattern (2). FcγRIIIb is a glycosylphosphatidylinositol (GPI)-linked protein expressed exclusively on neutrophils and it can be induced on eosinophils (3). Both FcγRIIIs are released from the cell surface. FcγRIIIa is released by the action of a metalloprotease upon in vitro activation of NK cells and macrophages (4,5). FcγRIIIb is released upon activation and during neutrophil apoptosis by proteolytic activity (6, 7, 8). Atherosclerosis pathogenesis is characterized by increased adhesion of monocytes to the injured endothelium, followed by their extravasation into the vessel wall (9). Within the wall, monocytes differentiate into macrophages and then turn into lipid-laden foam cells, which lead to the development of macroscopic fatty streaks (10). Monocytes also are transformed into activated macrophages which secrete cytokines and modify lipoproteins at least in part by oxidation (10). The expression of FcγRIIIa in macrophages is indicative of a functional subset of cells able to participate in humoral and cellular immune responses. FcγRIIIa is expressed only in a minor subset of peripheral blood monocytes (11) and has been shown to be present in vivo in human atherosclerotic plaques (12). Binding of LDL-immune complexes to Fc receptors on monocyte/macrophages activates responses that promote atherosclerotic processes (13). In addition, several members of the matrix metalloproteinase (MMP) family are produced by macrophages in human atherosclerotic plaques (14). Recently, we have succeeded in raising a new anti-FcγRIII monoclonal antibody (mAb), MKGR14, which specifically recognizes FcγRIIIaMϕ (15). 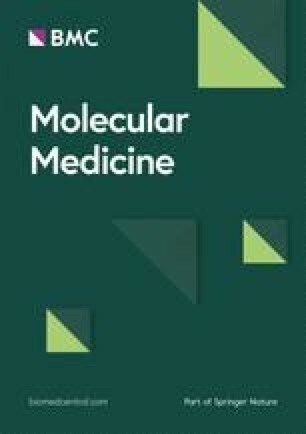 Using this antibody, we measured sFcγRIIIaMϕ in plasma and found that the level of sFcγRIIIaMϕ were increased significantly in patients with coronary artery diseases (CAD), but not in patients with vasospastic angina (VSA) or intact coronary artery, compared with age-matched healthy donors (16). These findings indicate that the macrophages are activated during the process of atherosclerosis. The next question is whether the macrophages are activated during the incipient stage of atherosclerosis, and whether sFcγRIIIaMϕ may serve as a marker for atherosclerosis. In the present study, to determine the activity of macrophages in incipient atherosclerotic status, we measured sFcγRIIIaMϕ in plasma from subjects whose atherosclerosis is not yet serious with an annual medical checkup. Three hundred and fourteen subjects (35 and 40 to 62 years) received a routine medical checkup for adult diseases. All subjects were staff members at our hospital, received a medical checkup at 35 years of age and one each year after they reached 40 years of age. Each subject gave written informed consent. Ten subjects with hepatic diseases were excluded from this study because sFcγRIIIs may be catabolized in the liver (17). Furthermore, two subjects with renal diseases also were excluded because sFcγRIIIs are excreted from the kidney (6). In support of this, we detected sFcγRIIIaMϕ, as well as total sFcγRIII, in urine at about 10% to 20% concentration of plasma levels in healthy donors (unpublished data). Twelve of 302 subjects were excluded for inflammatory disease (CRP ≥ 40 mg/L or leukocyte count ≥ 110 × 109/L), because inflammation activates macrophages as well as neutrophils. Clinical characteristics and laboratory findings in the remaining 290 subjects are shown in Tables 1 and 2. The subjects were divided into four groups (0, I, II, III) which had no, one, two, or three and over risk factors: such as aging, current smoking, diabetes, hypertension, hyper-LDL-cholesterolemia, hypo-HDL-cholesterolemia, and family history of atherosclerotic diseases. Age was set at more than 45 years old for males and for post-menopausal females. Smokers were defined as those currently smoking any tobacco. Diabetes mellitus was defined as those subjects who were under an active treatment with insulin or oral hypoglycemic agents, or who had a hemoglobin A1c of ≥ 6.5%. The subjects with diabetes were classified into category group III, even if they did not have any other risk factor. Arterial hypertension was defined in the presence of active treatment with antihypertensive agents or otherwise as a systolic blood pressure of ≥ 140 mmHg and/or diastolic blood pressure of ≥ 90 mmHg on at least two separate occasions. Hyper-LDL-cholesterolemia was defined as a documented LDL-cholesterol value ≥ 4.14 mmol/L (≥ 160 mg/dl). Hypo-HDL-cholesterolemia was defined as a documented HDL-cholesterol value < 1.03 mmol/L (< 40 mg/dl). Familial medical record of myocardial infarction, angina, or cerebral infarction was ranked. The trial was approved by the ethical committee at Kansai Medical University, Osaka, Japan. Clinical characteristics of subjects with an annual medical checkup. aThe subjects were divided into four groups (0, I, II, III) which had no, one, two, or three and over risk factors such as aging, current smoking, diabetes, hypertension, hyper-LDL-cholesterolemia, hypo-HDL-cholesterolemia, and family history of atherosclerotic diseases. bThe subjects with diabetes were classified into category group III, even if they did not have any other risk factor. cData is presented as the mean ± SD or n (%), as indicated. dSignificant differences compared with group 0 (*: P < 0.05, **: P < 0.01), compared with group I (#: P < 0.05, ##: P < 0.01), compared with group II (§§: P < 0.01). Laboratory findings in subjects with an annual medical checkup. aThe subjects were divided into four groups (0, I, II, III) which had no, one, two, or or three and over risk factors such as aging, current smoking, diabetes, hypertension, hyper-LDL-cholesterolemia, hypo-HDL-cholesterolemia, and family history of atherosclerotic diseases. dSignificant differences compared with Group 0 (*: P < 0.05, **: P < 0.01), compared with group I (#: P < 0.05,##: P < 0.01), compared with group II (§: P < 0.05, §§: P < 0.01). eLDL/HDL ratio indicates LDL cholesterol to HDL cholesterol ratio. Carotid ultrasonography was performed using an ultrasound imaging system (SONOS 5500; Philips, The Netherlands). The scanning and reading were performed by two well-trained physicians (K Amano and M Fukui). The physicians adopted the same ultrasonography protocol with the same system in the same lab. The imaging protocol involved obtaining a single longitudinal lateral view of the distal 10 mm of the right and left common carotid arteries. Maximum intima-media thickness (IMT) was defined as the single thickest wall among near and far wall on both sides of the common carotid arteries, carotid sinus, and internal carotid artery. “Thickening” of the wall was defined as a maximum IMT ≥ 1.1 mm in our hospital, according to the literature (18, 19, 20). Prior to the survey, the physicians discussed in detail, and verified, all the procedures to be used. The total sFcγRIII concentrations were measured by enzyme-linked immunosorbent assay (ELISA) as described before (21). Briefly, an ELISA plate (Nunc Immunoplate Maxisorp, Roskilde, Denmark) was coated with an anti-FcγRIII mAb, CLBFcRgranI, which recognizes all types of FcγRIIIs and was used as a capture antibody (Figure 1). After unbound sites had been blocked with 2% milk in phosphate-buffered saline (PBS), diluted ethylene diamine tetraacetic acid (EDTA) plasma in high performance ELISA buffer (HPE buffer; CLB, Amsterdam, The Netherlands) was incubated in the wells for 1 h at room temperature. After washing with PBS containing 0.02% (v/v) Tween-20, the plates were incubated with a biotin-labeled rabbit anti-FcγRIII antibody, which recognizes all types of FcγRIIIs and was used as detection antibody. After incubating with horseradish-peroxidase-labeled streptavidin, the amount of sFcγRIII was detected with tetramethylbenzidine and H2O2. 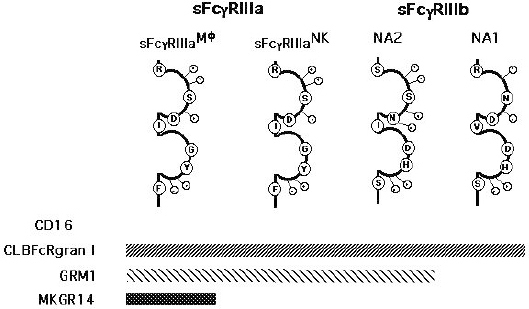 Schematic representation of sFcγRIIIs and binding specificity of anti-FcγRIII mAb. ⊙— represents potential N-linked glycosylation site. The sFcγRHIaMϕ concentrations were measured with a sensitive chemiluminescent ELISA with an anti-FcγRIIIaMϕ mAb MKGR14, which specifically recognizes FcγRIIIaMϕ (15). MKGR14 bound to cultured monocytes, a subpopulation of monocytes, and peritoneal monocytes/macrophages, but not to NA1NA2-neutrophils or NK cells. Immunoblotting assay showed that MKGR14 precipitated FcγRIIIaMϕ from the lysate of cultured monocytes, but did not precipitate FcγRIIIb or FcγRIIIaNK from the lysate of NA1NA2 neutrophils or large granular lymphocytes, respectively. In addition, MKGR14 precipitated only 50–60 kDa protein from the lysate of biotin-labeled cultured monocytes. All these results show that MKGR14 specifically recognizes FcγRIIIaMϕ. A white ELISA plate (LumiNunc Plates, Roskilde, Denmark) was coated with MKGR14, which was used as capture antibody (see Figure 1). After unbound sites had been blocked with 0.2% highly purified casein in PBS, diluted EDTA plasma in HPE buffer was incubated in the wells overnight at 4° C. After washing, the plates were incubated with a biotin-labeled anti-FcγRIII mAb GRM1, which recognizes NA2-FcγRIIIb and FcγRIIIa and was used as a detection antibody (see Figure 1). After incubating with alkaline phosphatase-labeled streptavidin, the amount of sFcγRIII was detected with CDP-Star Substrate and Sapphire-II (Applied Biosystems, Bedford, MA, USA) in a MicroLumat Plus microplate luminometer (Berthold Technologies, BadWildbad, Germany). A calibration curve was constructed with pooled plasma from healthy donors and the concentration of sFcγRIIIs in this pool was set at 100 arbitrary units (AU), as described before (15,16,21). So the sFcγRIIIaMϕ or total sFcγRIII concentrations are presented as the percentage of sFcγRIII compared with the amount of sFcγRIII in the pooled plasma. Differences in sFcγRIII levels or laboratory data among the groups were tested by analysis of variance (ANOVA) with Fisher’s protected least resistance significant difference (PLSD) post hoc test. Correlations of sFcγRIII levels with laboratory data were tested by Fisher’s z-transform test and multiple regression of carotid maximum IMT was tested by ANOVA. Using FcγRIIIaMϕ-specific anti-FcγRIII mAb (15), we measured sFcγRIIIaMϕ derived from macrophages in plasma. The level of sFcγRIIIaMϕ increased with age, and correlated positively with body mass index, blood pressure, LDL cholesterol to HDL cholesterol ratio, triglycerides, hemoglobin A1c, and creatinine-but negatively with HDL-cholesterol levels (Table 3). 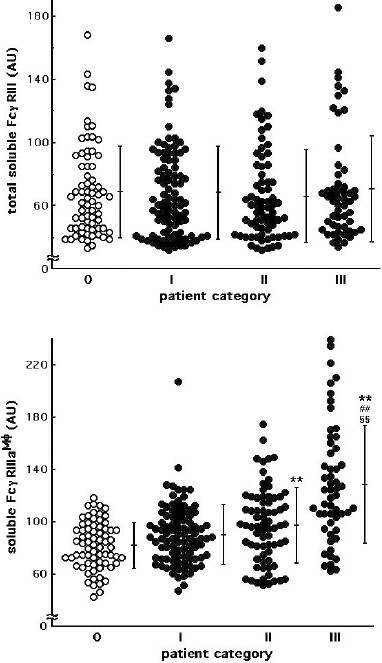 In contrast, the total sFcγRIII levels correlated positively with leukocyte counts but negatively with triglycerides. No correlation between the levels of two sFcγRIIIs was observed in subjects with an annual medical checkup. Simple correlation between sFcγRIII levels and laboratory findings in subjects with annual medical checkup. aSignificant correlations (*: P < 0.05, **: P < 0.01). bLDL/HDL ratio indicates LDL cholesterol to HDL cholesterol ratio. chs-CRP, high-sensitivity C-reactive protein. Correlation between sFcγRIII levels and hs-CRP were calculated in 245 subjects, and the other 45 subjects showed less than 0.2 mg/L, limit of measure of hs-CRP. As shown in Figure 2, the sFcγRIIIaMϕ levels were related to a number of risk factors for atherosclerosis including aging, current smoking, diabetes, hypertension, hyper-LDL-cholesterolemia, hypo-HDL-cholesterolemia, and familial history of myocardial infarction, angina, or cerebral infarction. It was not clear which factor was most effective in increasing levels. Subjects were selected who had no risk factor for atherosclerosis except targeted risk factor or aging. Each control group was matched for age. As shown in Table 4, aging, smoking, diabetes, hypertension, or hyper-LDL-cholesterolemia itself affected on plasma sFcγRIIIaMϕ levels, but family history of atherosclerotic diseases did not influence the plasma levels. In contrast, the total sFcγRIII levels did not change with the number of risk factors. Effects of gender on sFcγRIIIs levels also were analyzed and higher sFcγRIIIaMϕ and lower total sFcγRIII levels were shown in males than in females (Table 4). Concentration of sFcγRIIIaMϕ (upper) and total sFcγRIII (lower) in plasma from subjects with an annual medical checkup. The subjects were divided into four groups (0, I, II, III) which had no, one, two, or three and over risk factors including aging, current smoking, diabetes, hypertension, hyper-LDL-cholesterolemia, hypo-HDL-cholesterolemia, and family history of atherosclerotic diseases. Each horizontal bar with a vertical line is the mean ± SD. Significant differences compared with group 0 (**: P < 0.01), compared with group I (##: P < 0.01), and compared with group II (§§: P < 0.01). aSubjects for annual medical checkup have no risk factor for atherosclerosis except indicated risk factor or aging. bSignificant differences compared with controls or male (*: P < 0.05, **: P < 0.01), compared with former smokers (##: P < 0.01) or compared with border hypertension (#: P < 0.05), or compared with low HDL (§: P < 0.05, §§: P < 0.01), or compared with high LDL (†: P < 0.05, ††: P < 0.01), or compared with high L/H (‡: P < 0.05, ‡‡: P < 0.01). cControl indicates age-matched healthy controls. dData is presented as the mean ± SD. mL/H, LDL cholesterol to HDL cholesterol ratio. qhigh L/H, high LDL cholesterol to HDL cholesterol ratio. It is known that IMT is an early marker for atherosclerosis (22), and maximum IMT generally was related to the number of risk factors for atherosclerosis. Fifty-four subjects (M/F = 22/32, 51.3 ± 5.8 years) were recruited randomly and examined using an ultrasound wall tracking system for IMT measurements. 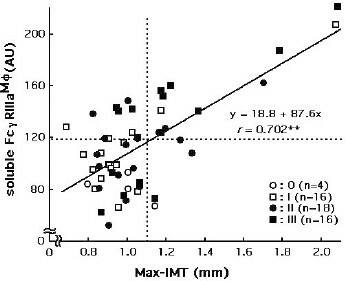 As shown in Figure 3, the sFcγRIIIaMϕ levels were well correlated with carotid maximum IMT (n = 54, r = 0.702, P < 0.01). The sFcγRIIIaMϕ levels were compared with the other markers on contribution of maximum IMT by multiple regression method. As shown in Table 5, the sFcγRIIIaMϕ levels were correlated more with maximum IMT than hs-CRP or the other markers. Correlation between sFcγRIIIaMϕ levels and carotid maximum intima-media thickness (IMT) in subjects with an annual medical checkup. The subjects were divided into four groups (0, I, II, III) which had no, one, two, or three and over risk factors including aging, current smoking, diabetes, hypertension, hyper-LDL-cholesterolemia, hypo-HDL-cholesterolemia, and family history of atherosclerotic diseases. Dotted lines indicate reference value. Significant correlations (**: P < 0.01). Multiple regression of carotid maximum IMT with sFcγRIIIMϕ level and laboratory findings in subjects with annual health checkup. ahs-CRP indicates high-sensitivity C-reactive protein. bSix subjects who showed less than the 0.2 mg/L limit of measure of hs-CRP, applied with 0.19 mg/L. In Figure 3, the data of four subjects appear to be outliers driving the apparent high correlation in the linear regression analysis. Therefore, the analysis of this data was set when the four subjects who appear to be outliers were excluded. The sFcγRIIIaMϕ levels still were correlated with carotid maximum IMT (n = 50, r = 0.327, P = 0.02). Macrophages play a major role in the development of vascular lesions in atherogenesis. Recently, we measured sFcγRIIIaMϕ in plasma and found that the levels of sFcγRIIIaMϕ were increased significantly and related to the number of significantly affected coronary arteries in patients with coronary artery diseases (CAD) (16). In addition, the levels of sFcγRIIIaMϕ also increased with age in healthy donors (n = 102, 19–74 years, 41.8 ± 13.9 years). It is well known that atherosclerosis progresses gradually with age. To determine the activity of macrophages in incipient atherosclerotic status in the present study, we measured sFcγRIIIaMϕ in plasma from subjects with an annual medical checkup. The levels of sFcγRIIIaMϕ increased with age, and correlated positively with body mass index, blood pressure, LDL cholesterol to HDL cholesterol ratio, triglycerides, hemoglobin A1c, and creatinine, but negatively with HDL-cholesterol levels (Table 3). In addition, the levels of sFcγRIIIaMϕ were related to the number of risk factors for atherosclerosis (Figure 2). sFcγRHIaMϕ is released by the action of a metalloprotease upon in vitro activation of macrophages (5). These findings indicate that the macrophage activation begins during the incipient stage of atherosclerotic process. One of the characteristic features of atherosclerotic lesions is the infiltration of monocytes/macrophages and T lymphocytes into the subendothelial space (9), which shows immunologically competent cells playing a key role in chronic inflammation. It has been shown that the levels of inflammatory markers in serum, such as C-reactive protein, TNFα, and IL-6, are increased in patients with atherosclerosis (23). Because the FcγRIIIa is released from NK cells and macrophages, and FcγRIIIb is released from neutrophils on activation (4, 5, 6, 7, 8), the sFcγRIIIs in plasma also are a kind of marker for inflammation. In this study, the levels of sFcγRIIIaMϕ, but not total sFcγRIII levels, increased with the number of risk factors for atherosclerosis (see Figure 2), and no correlation between the levels of two sFcγRIIIs (Table 3) was observed in subjects with an annual medical checkup. Increased IMT is considered as an earlier morphological evidence of atherosclerosis before the formation of plaque and disturbance in blood flow (22). Fifty-four subjects were recruited randomly and examined with ultrasonography for IMT measurements. The sFcγRIIIaMϕ levels were well correlated with carotid maximum IMT (Figure 3 and Table 5). Generally, maximum IMT was related to the number of risk factors for atherosclerosis. In this study, a positive correlation also was shown between maximum IMT and the number of risk factors (n = 54, r = 0.315, P = 0.02). However, some subjects were excluded from this correlation, for example, one subject from Group I showed an extremely thick IMT, at 2.06 mm. In this case, the sFcγRIIIaMϕ level also was high with a value of 205 AU. In summary, the sFcγRIIIaMϕ levels were related to the number of risk factors for atherosclerosis including aging, current smoking, diabetes, hypertension, hyper-LDL-cholesterolemia, and hypo-HDL-cholesterolemia. In addition, the sFcγRIIIaMϕ levels were correlated with carotid maximum IMT. These findings may show that macrophages are activated during the incipient stage of atherosclerosis, and that sFcγRIIIaMϕ may serve as a predictive marker for atherosclerosis. We thank Masja de Haas and Federico Garrido for their generous gifts of antibody. This work was supported in part by grants from the Ministry of Education, Grant-in-Aid for Scientific Research (C) (14572192, 17590503, and 19590575) (M Masuda) and from Setsuro Fujii Memorial The Osaka Foundation for Promotion of Fundamental Medical Research (S Y Hong).